Cut your terry cloth into 11 x 11 squares. Set aside. If you're making bias tape, lay your fabric out in front of you. The whole idea of bias tape is to cut on the bias, meaning on a 45 degree angle. For these washcloths, you are wanting to cut 2 inch strips on the bias. With a long quilter's ruler, place it on the fabric on the 45 degree diagonal and begin cutting 2 inch strips. Once you have a handful of strips, piece them together. (Here is a great bias tape tutorial that shows how to piece the strips together to create one long strip. I forgot to take a picture of how to piece the strips!) You will have one long piece of a fabric strip. Once you have your long strip, pull out your handy bias tape maker. Simply insert one end of the fabric strip into the bias tape maker and pull it through. As you gently pull the fabric through it will actually create two folds on both sides of the strip. With one hand pulling on the little handle of the bias tape maker, your other hand will iron the fold you just created! Magic! Isn't it beautiful?? Now you can wind it around some cut cardboard and you're done! Once you have your bias tape and cut terry cloth you're ready to assemble. There is no pinning necessary. All you're doing is inserting each side of the terry cloth into the double fold bias tape as you sew all four sides. When you come to the end, the last side, just cut the bias tape 3/4 inch longer than the end of the terry cloth and tuck it in before you finish off the end. That is it! Wouldn't these be pretty wrapped up for a new mama? Or wrapping up some of your homemade bias tape as a gift?? These washcloths are both simple and functional. Both I like. And now for the winner of the fabricworm giveaway! This would be a very cool win-thanks! Please leave your choice of 2 yards of fabric in the contact section above. And congrats!! I'm excited to bring back the series Wee Ones that was interrupted some months back. Instead of finishing up the one week series I thought it would be much more exciting to keep it a regular series in this space. So the Wee Ones series is back! And sharing homemade rice cereal is the perfect place to pick up from where we left off. 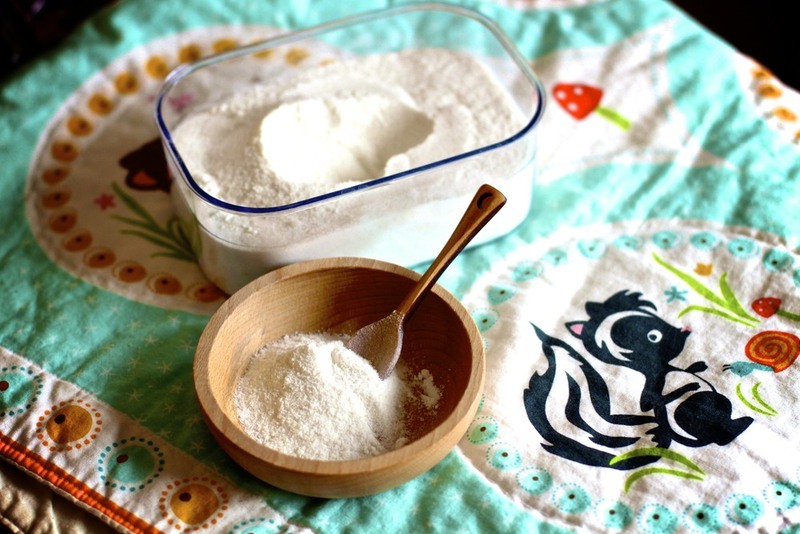 Making your baby's first solid food yourself is so much more fulfilling, cheaper, healthier, and satisfying. You'll be amazed at how easy it is to make your own rice (barley, oat, quinoa, and so forth) cereal. No more buying the boxed stuff. Add rice to your blender. Blend it until it is finely ground like powder. Store in an airtight container. Add 1/4 cup of ground grain to 1 cup of water. Whisk or stir constantly for about 10 minutes over low heat. You'll have a nice, creamy consistency. Add your liquid of choice to make a thinner cereal as necessary for baby. I make Rowan's cereal every 3 days when I'm already over the stove cooking the rest of the family's breakfast. The cereal cooked and refrigerated is good for up to 72 hours. If your baby is eating your homemade cereal often you can store the cooked cereal in ice cube trays as well and make double or triple batches to save time. I think he's getting the hang of it. I've really enjoyed the process of making and heating up Rowan's homemade rice cereal. The sky is the limit with trying other grains as well! I think a variety of ground grains stored in glass jars would be a unique baby gift for a new mama with the cooking instructions included. You'd think after four kids I'd remember how messy new eaters can be. I am in desperate need of some little wash clothes for wiping up I'm reminded every day. I'm privileged to be a part of the oldest and largest women's organization in the world--the Relief Society--with over 6 million women in 170 countries. We serve others, the community, get involved in humanitarian aid, learn to garden, budget, become stronger spiritually, and so on and so forth. It is an incredible organization within my church. In my congregation, my responsibility is to help plan events for our local Relief Society. In March, we celebrate the birthday of the organization with a special celebration which always includes good food. Our planning committee came up with a beautiful theme for our celebration (It is this Thursday evening!) of "Birds of a Feather Flock Together". Every part of the evening is in keeping with the theme, including the very pretty favor: the spring nests. The Relief Society committee was in my home this Saturday morning to finish our planning and put these nests together. They were so absolutely adorable I couldn't help but share them with you today--with plenty of time for you to try them out for any of your Easter celebrations. Think of the nests just like making rice crispy treats, just with chow mein noodles. Heat the butter in a stockpot over medium heat. Add marshmallows and peanut butter and stir until melted. Add chow mein noodles and stir until they are coated. Take a handful of chow mein mixture and form into a nest. Form it on a counter top so it will have a flat bottom. With you hands, work the side of the mixture to create a nice rim to your nest. Turn your coconut into green glass. Toss some coconut into a ziplock bag with a few drops of green food coloring, seal and toss. Voila! Green Grass. Spoon a little melted chocolate inside each nest to just cover the bottom so the coconut will stick. Now sprinkle the chocolate with green coconut. Place a few candy eggs in each nest. Amber, my friend who shared the recipe, makes these with her children every Easter. It is their special project they do together this time of year. We made several batches and they came together quite easily. They would be fun for families and beyond: events to raise money, to give to neighbors, or for other spring-time events. And they bag up pretty, too. I'm definitely feeling excited for a very special, meaningful week with my family this week leading up to Easter Sunday. Yesterday being Palm Sunday, I thought it the perfect time to teach my girls the meaning of the Easter Egg, the most beautiful symbol of new life. What a wonderful week it is to teach our children. I've been feeling the need to start it. Especially when I'm approached throughout the week with requests to do this and that with this child or that child. We call it one on one time. Each week a little time is set aside for each child (except Rowan--he gets one on one time quite frequently!) to choose what they'd like to do with mommy. Sometimes the time is scheduled in to the week, other times it fits right in while other children are in a class or off doing something on their own. Either way, it happens and is absolutely more fun than I thought it would be. It is so telling to watch the little personalities that live under this roof based on each activity they chose to do with me. I get to know them, what they love, how they think and explore a little more in these quiet, sacred moments with just one. Caroline- wanted to bake something just with me. Her sisters weren't even allowed anywhere near the island in the kitchen where we were. We baked something new together, Caroline calling the shots. With just one at the counter I was able to go a little deeper about proper measurements, eyeing things, and so forth. Baking is her love and having just me to do it with her made her so happy. Johanna- wanted to make something. So we made something Egyptian, of course, just the two of us. Because Johanna is my quieter child, we crafted in mostly silence as she focused on her work and I on mine. But we sat so closely to each other that we could feel each other's excitement in sharing the moments together. Annabelle & Ainsleigh- wanted to play play dough! How simple and sweet, we sat and made ducks and duck food for almost an hour. Rolling and cutting and feeding their play dough ducks, our one on one time was absolutely satisfying and silly. It is something new in our week. It takes just a little extra planning on Sunday evening with the kids but makes an incredible difference with the relationships with my children and how they see their mother. I think this is becoming my favorite time of the week. Definitely some of my week's best spent time. How do you make time for your children?? I'd love to hear. If you hadn't noticed in our "currently reading" corner of the blog over the past months, we've had our noses in many Indian books. My Johanna is in love with the little princess Pocahontas and Squanto and now, Kaya. One of the most exciting presents given this Christmas has only encouraged their play of "Indians", shooting buffalo, and cooking outdoors: their homemade tee pee. There are some things you make that you like and other things you make that you love. 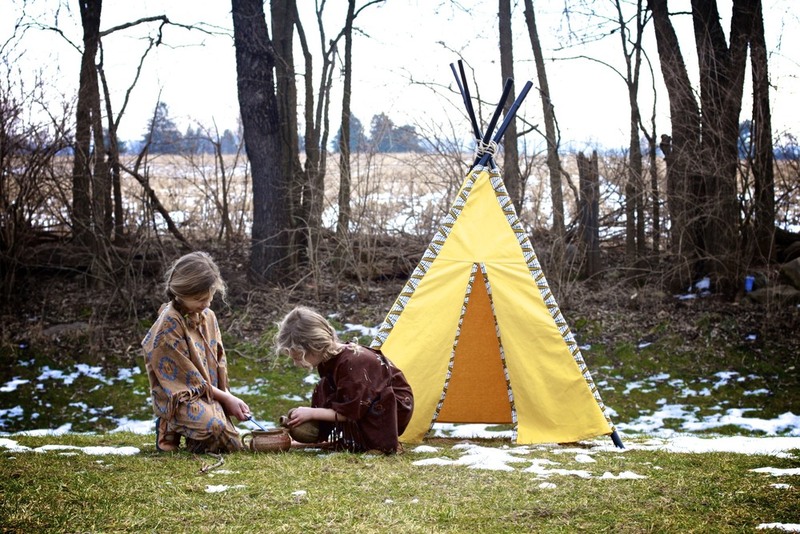 I definitely fell in love with this tee pee as I watched it come together the night I sewed and created it. The only supplies I bought were the 3 yards of yellow canvas and the four dark brown bamboo rods. I was determined to use whatever decorative fabric I had on hand for the accent rod casing. I was a little nervous to see how the two fabrics would work together and now I think they thoroughly compliment each other. I loved that the pattern was made in such a way that the wrong side of the fabric really turns out to be the right side--the interior of the tent turns out to have finished off edges and the unfinished edges of the exterior become covered by the accent rod casing. Sliding the bamboo rods into the casing on Christmas Eve with Bobby was absolutely thrilling as we watched it finally come together. It all came together! And thanks to the collaboration with my mother, two little girls' dreams came true with their own Indian dresses and pouch. And they've been little squaw ever since. Braids in hair and keeping a watchful eye out for flying arrows in the house is the new norm. I knew a few months ago that I wanted to make Johanna something special to keep and inspire her new found skill of embroidering. And this was her special homemade gift from mommy for Christmas: an embroidery basket. It sits by the fireplace now. Ready and waiting for her to pick up and get stitching. 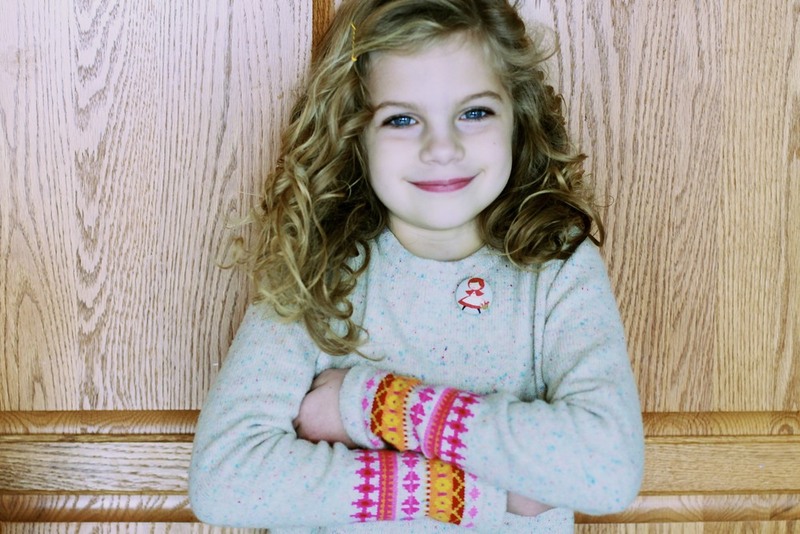 Embroidery is excellent for little hands. With a blunt needle, some embroidery floss, a hoop, and burlap (because there are large holes for stitching), a child can sit and create, spell, or follow a design. It is a calming activity, a perfect replacement for television. And when done next to you, there can be gentle guidance in the art of keeping the needle threaded. I put two sizes of embroidery hoops in her basket, both reasonable sizes for her five year old hands. The fun part is choosing a rainbow of colors of embroidery floss. I made a little needle book with a piece of wool felt cut with pinking sheers, stitched down the middle to create a little book. Add a needle threader and three embroidery needles and you're set. I cut a variety my fabrics into squares: burlap, cottons, and linen. While most of the fabrics are blank, I chalked on a few pieces of fabric for Johanna to use as a pattern. The basket itself was a thrill to make. With a mix of vintage and new fabrics, I used this fabric handled basket pattern. It sewed up easily and the pattern will definitely be a keeper. It is a very versatile pattern with two sizes of baskets and the option of the exterior pocket wrapped around the basket, just half, or without. And the pattern is only $7.95. I'd line the basket with one or two layers of batting next time or use canvas somewhere to make it sturdier. Lastly, a good pair of scissors are needed for the embroidery basket if the child is old enough to use them. Johanna got some [amazon_link id="B0019IG89O" target="_blank" ]student sewing scissors[/amazon_link] for Christmas. Today I'm starting a new embroidery project myself. I'm loving the book [amazon_link id="1607055252" target="_blank" ]Little Stitches[/amazon_link] so much. If you're new to embroidery, it teaches you the basic stitches and has patterns all ready to be transfered for you to get started! I'm ready to get my needle through some cotton of my own. Sounds like the perfect January activity to me. Welcome to our little neighborhood of paper houses! With all of these covered button goodies to package for nieces and nephews and little friends, I wanted something to still show off all of the colors on the fabrics and watercolored jewelry cards. 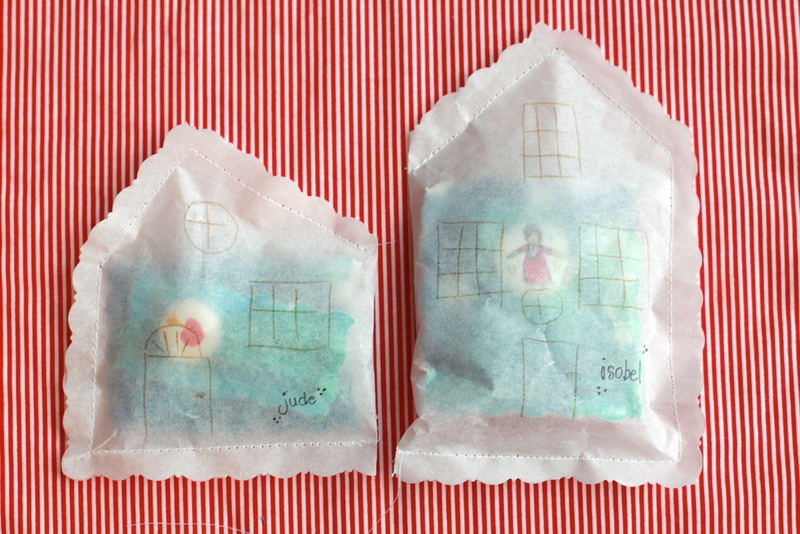 I came up with sewn paper house packaging. If you use parchment paper than you can 1) easily sew on it with your machine and 2) sew through it! Simply put you little items to be packaged inside a fold of parchment paper. With your sewing machine, sew around two of the three sides needed to make the base of a house (remember one side will be the fold). Now create the pitched roof of the house in two stitches as seen above. That's it. To save on time and paper, create your sewn houses close to each other in one sitting before cutting them out. With decorative scissors, cut out the house leaving a nice 1/2 of paper from the seam. Decorate the house! I used a gold pen/marker so it added detail but wouldn't take from seeing some of the goodies inside. Add windows, a door, and a name. The funnest part will be the child opening the package since they get to tear open the house to get its contents. Any ideas you have for wrapping little gifts? I'd love to hear. I can easily say that button pins are my favorite button gifts in this series. I liked making the jewelry cards for the pins the most as well. 1. Have the kids make art with watercolors. Using nice, thick watercolor paper, let the kids create. Some of my children created beautiful color washes. Others painted pictures with people and animals. Either approach turns out perfect with making jewelry cards. 2. With decorative scissors, trim the watercolored paper into small squares and rectangles. 3. If you made a ring, cuff link, tie tack, or pin, create an opening to slip the item onto the jewelry card. This is what a pin's slot looks like. That is it. Slip the items into the cards, write on them, personalize them. Have fun. And earrings. (There are a pair of pink ones above.) These are the posts and backings we used. A perfect gift for a little one who just pierced their ears. 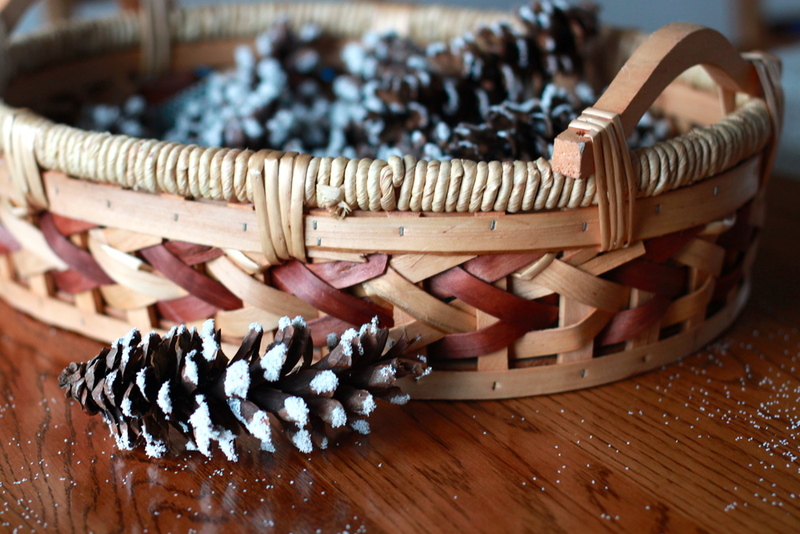 We glued and glittered until our basket was full with snowy pinecones. And then decorated the tree with out little decorations nature gave us. To make the glue, use 2 parts glue to one part water and mix. I poured the watered down glue into small mason jars for each of the girls to use. 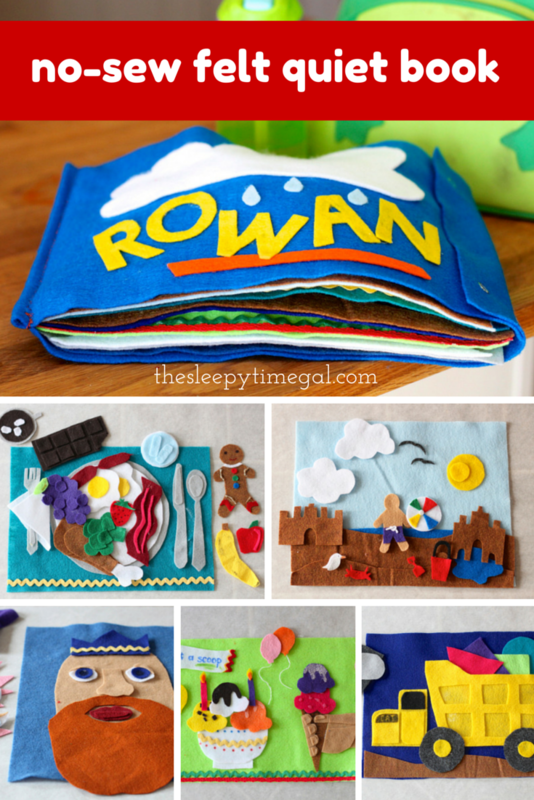 This is a wonderful project for kids 3 and up. They caught on pretty fast to hold the pinecone upside down and brush the glue down. Kids can sprinkle on glitter or roll the pinecone in glitter on a plate. The pinecones look quite stunning against the green tree, surrounded by white lights. We sure enjoyed ourselves. And somehow Rowan (who slept through it all) ended up with glue in his hair. Go figure.